How much weight does a prior conviction carry at sentencing for a current offense? The answer is that it greatly depends where the offender is sentenced. In some states, a prior felony means a few extra months imprisonment. In others, it can mean additional years. In 2015, the Robina Institute of Criminal Law and Criminal Justice published the Criminal History Enhancements Sourcebook, which provides a detailed comparison of the various ways 18 U.S. sentencing guidelines jurisdictions use an offender's prior criminal record to enhance punishment for a current crime. 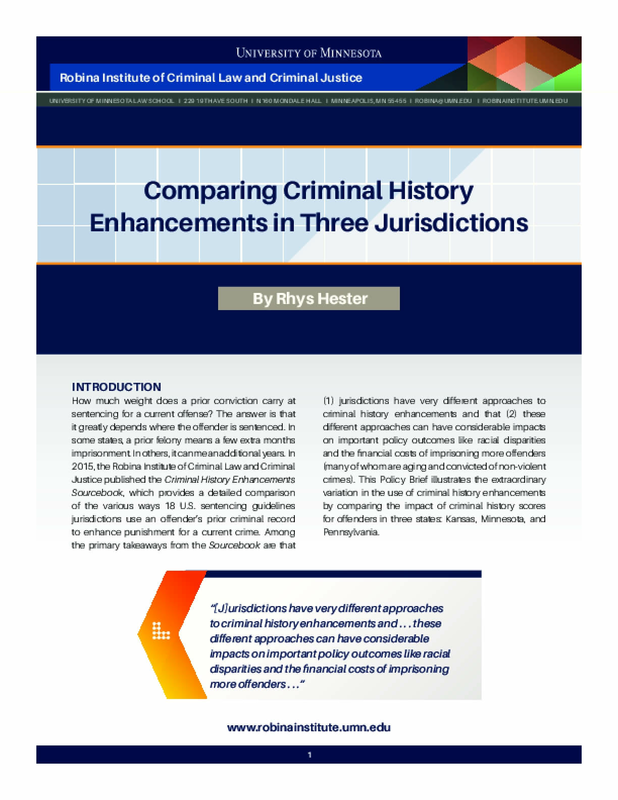 Among the primary takeaways from the Sourcebook are that (1) jurisdictions have very different approaches to criminal history enhancements and that (2) these different approaches can have considerable impacts on important policy outcomes like racial disparities and the financial costs of imprisoning more offenders (many of whom are aging and convicted of non-violent crimes). This Policy Brief illustrates the extraordinary variation in the use of criminal history enhancements by comparing the impact of criminal history scores for offenders in three states: Kansas, Minnesota, and Pennsylvania. Copyright 2016 by Robina Institute of Criminal Law and Criminal Justice. All rights reserved.